This stack is for when you do want to be productive, but there’s too much on your mind, and too much to do, but you can’t clear your head enough to focus. Tianeptine alone is a potent tool for calm and mood elevation, but when combined with Aniracetam and Citicoline, becomes a powerful productivity device for stressed people. Taking this stack will reduce stress and increase productivity for two to three hours, or up to 5 with an extra dose of Aniracetam. Residual effects last up to 10 hours afterwards. This stack can be taken daily, although if tolerance builds, taking some time off might be necessary. Aniracetam, similar to other racetams, has benefits to cognition, motivation, and focus. What makes Aniracetam unique is its anxiety-reducing effect. 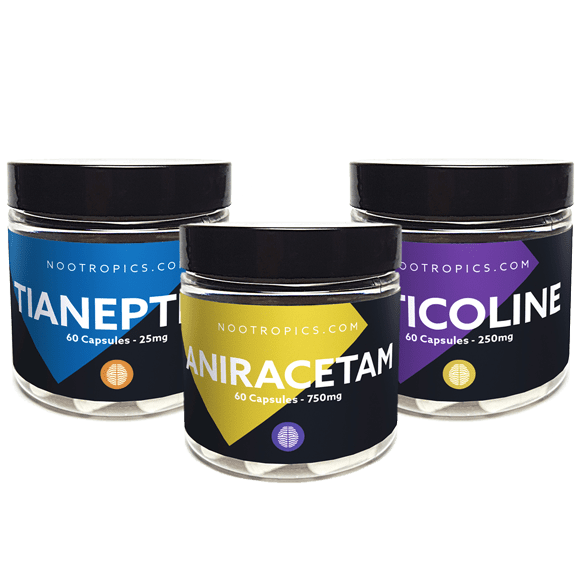 Aniracetam has a shorter half life than Phenibut, so if necessary, a second dose of Aniracetam can be taken after 3 hours to extend the effects of this stack. Tianeptine is a very effective nootropic for mood brightening and against anxiety and stress. As opposed to Tianeptine Sodium (Stablon), Tianeptine Sulfate has a long lasting effect of over 5 hours. A second dose of this stack can be taken after its effects wear off, to cover the rest of the day. Citicoline has modest cognitive benefits by itself, but in this stack it is meant to potentiate the Aniracetam. The latter interacts with the brain’s acetylcholine system, and taking Citicoline supports this. Citicoline also prevents the headache that can be brought on by Aniracetam’s interaction with the acetylcholine system. Capsules per day: 1 capsule of each, up to twice per day. An additional Aniracetam capsule can be taken 3 hours after taking the stack, if needed. Effect duration: Peak effect for 2 – 3 hours, extended up to 6 with another capsule of Aniracetam. Residual effects up to 10 hours afterwards. Extended use: This stack is safe for extended use, and may have compounding benefits if taken daily. If tolerance builds up, taking a break for a week can restore potency. After 2 – 3 hours, another dose of Aniracetam can be taken to extend the effects of this stack. Do not consume alcohol if you have taken Aniracetam or Tianeptine.